Julian Gollop talk about his new X-com like creation at EGX Rezzed 2018. 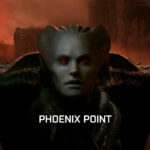 Phoenix Point. He showed the differences between Phoenix Point (saying that it is the spiritual successor of the original xcom) and the new Xcom from Firaxis. In the video he talks about the basic concept, the story, the factions in the game and the original target system in the first person. Definitely one of the most anticipated turn-based games of this 2018. The final release is scheduled for December 2018.